There’s a magical place inside the medieval walls of Saint-Émilion. A place where vines climb the 14th century walls of a partially ruined cloister. A place that is more than meets the eye, with a labyrinth of underground tunnels stretching for 3 kilometers in the bowels of Saint-Émilion. It’s Les Cordeliers and that labyrinth beneath it is where sparkling wines have been produced for more than 120 years. Les Cordeliers gets its name from its first ever inhabitants, monks also called Les Cordeliers. They were Franciscan monks who followed rules established by St. Francis of Assisi, and gained their name when Jean de Beauffort declared them Les Cordeliers during the 7th Crusade because of the cord belt that secured their brown robes. Originally the monks lived at a monastery near to Saint-Émilion. But when clashes in the Aquitaine region during the 100 Years War saw their monastery pillaged, they requested permission to move within the fortifications of Saint-Émilion to protect themselves. The Pope granted them permission and Les Cordeliers immediately began work on their new monastery and cloister in 1338 at the present-day location of Les Cordeliers. The monks lived and worked at the monastery for four centuries, expanding it to include the monastery with a dormitory containing six bedrooms, cloister, a church (which we see the ruins of today), a vineyard, a vat room, a cellar, and a vegetable and herb garden. 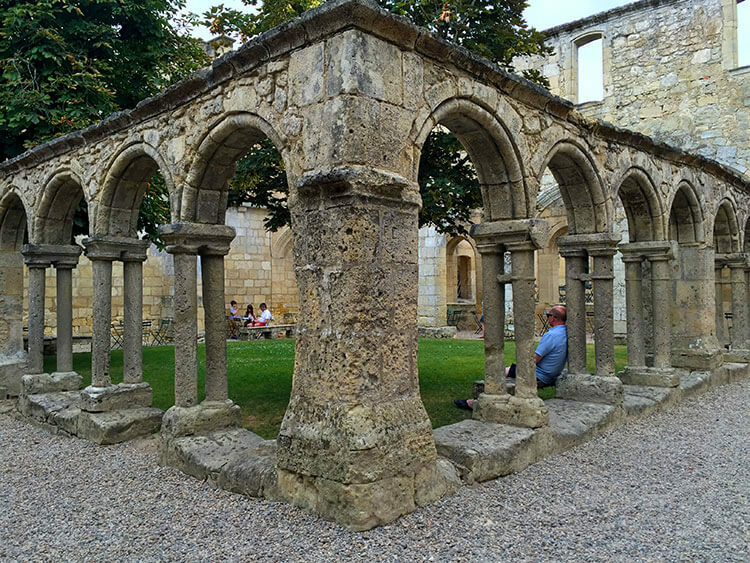 During the French Revolution in 1789 the Les Cordeliers order was banned and all 284 monasteries, including the Saint-Émilion monastery, were closed down. The entire monastery was sold as a national property in 1791 and the monks were expelled. The French Revolution eventually ended and the Cordeliers order was re-instated in 1850, but no one from the order came to reclaim the Saint-Émilion monastery. It was left abandoned and nature took its course. The charming space locals and tourists alike enjoy today was like something out of a horror movie with the ivy practically strangling every inch of the crumbling stone. In the 19th century a new owner by name of Mr. Meynot purchased the decaying monastery. He was a wine maker, but didn’t have the best success selling his wine. 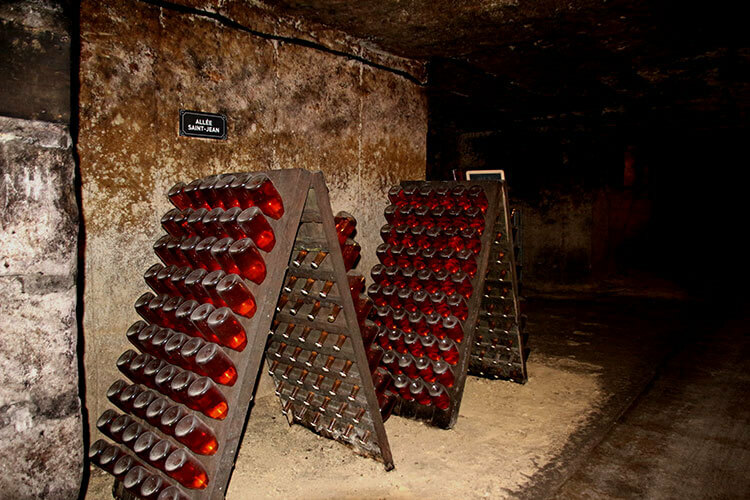 He had the idea that the tunnels beneath it would be perfect for fermenting and aging his Saint-Émilion wines in the Champagne method, and so he went north to Champagne to study the process of making sparkling wine. In 1892 Mr. Meynot established his sparkling wines under the name MM.G.MEYNOT et Compagnie. There’s been many owners of Les Cordeliers since Mr. Meynot in the 19th century, and each has carried on the tradition of producing sparkling wines in the tunnels beneath the monastery. The current owners are Pauline and Stanislas Cattiau, who proudly carry on producing this unique wine that has been produced in Les Cordeliers now for more than 120 years. Les Cordeliers is free to enter and you can explore the garden and cloister at your leisure year round during opening hours. 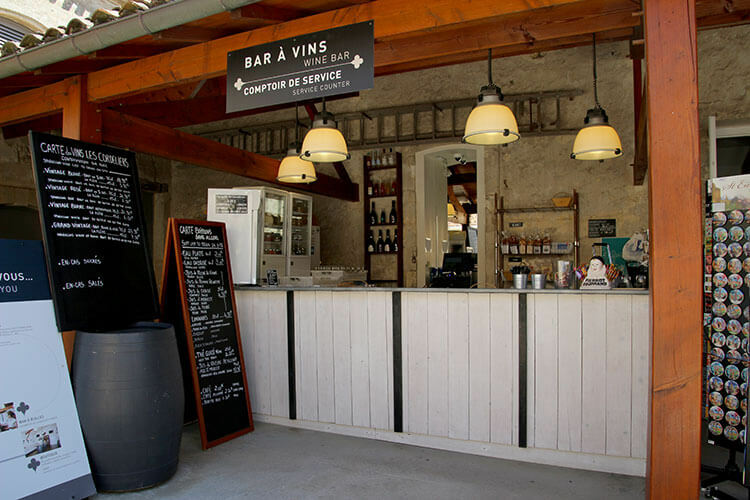 There’s a wine bar where you can purchase picnic hampers with regional rustic specialties to enjoy with a glass or bottle of Les Cordeliers Crémant de Bordeaux, and non-alcoholic drinks like grape juice, lemonade, iced tea and coffee are available. It’s a lovely spot in Saint-Émilion to just sit and enjoy a glass of wine. In order to visit the underground tunnels and cellar, you must visit on a guided tour. In July and August, guided tours in English are available daily at 5:30pm and explore a small portion of the tunnels while you learn about the methode champenoise (or traditional method since even the term “methode champenoise” cannot be used outside of the Champagne region to describe how a sparkling wine is made) used to produce Crémant de Bordeaux. From April through the beginning of November, a guided tour of Saint-Émilion and Les Cordeliers is also available by Tuk Tuk – yes, that exact kind of cycle rickshaw from Asia. Having done both the guided walking and Tuk Tuk tours, either is excellent. You cover much more of the maze of tunnels on the Tuk Tuk tour as you enter through a back entrance not available to the public, then are amazed as your Tuk Tuk driver expertly navigates around tight corners and through narrow passageways. No matter which tour you choose, you’ll learn that these tunnels were created when the stone was quarried to build Saint-Émilion. Situated 17 meters below the surface, this particular set of tunnels stretches for a total length of 3 kilometers and have a constant temperature of 12°C (53°F). The temperature and darkness are the perfect conditions for fermenting and aging a sparkling wine in the traditional method. You won’t, however, see the vines that the wines are produced from. The vineyards themselves are actually located in Entre-Deux-Mers, which is one of the Bordeaux appellations and gets its name from its location between Bordeaux’s two tidal rivers: the Garonne and the Dordogne. The grapes are entirely harvested by hand, then pressed and fermented as any traditional wine. Les Cordeliers produces a range of brut and demi-sec sparkling white and rosé wines distinguished by the Prestige, Vintage and Grand Vintage ranges. The Grand Vintage is Les Cordeliers best wine produced from their most exceptional vines. No matter which of their wines you choose, they are all bottled directly after the alcoholic fermentation and blending. The bottles are stored upside down in racks and turned daily in a process known as riddling in order to naturally let the yeasts create gas during a second fermentation. The wines are all aged a minimum of 12 months before the yeasts are disgorged in a method of placing the neck of the bottle in freezing liquid. This causes the yeasts trapped near the cap to freeze in the neck, then the crown cap is popped off and the pressurized bottle makes the frozen chunk of yeasts quite literally shoot out of the bottle. The bottles are quickly topped up with liqueur d’expédition (a mixture of the base wine and sugar), then corked and fitted with their wire caps. You might be surprised, especially if you haven’t yet visited Champagne, that the cork is straight and much larger than the neck of the bottle. 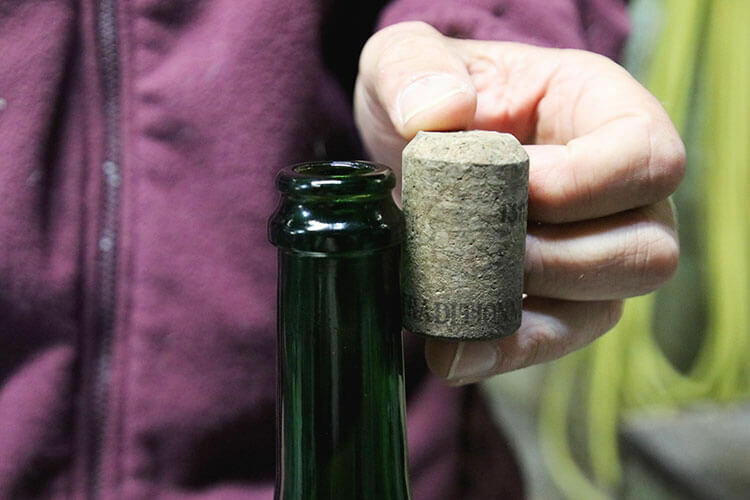 It’s compressed down in size during corking to seal the bottle and the pressure is what makes the cork expand and take on it’s mushroom shape. The tour ends with a short presentation of the range of white and rosé AOC Crémant de Bordeaux that Les Cordeliers produces. You’re welcome to try the various sparkling wines and select one to enjoy a full glass of in the cloister or garden. Les Cordeliers is located in the village of Saint-Émilion. Saint-Émilion is easily reached from Bordeaux Center by Oui SNCF train. 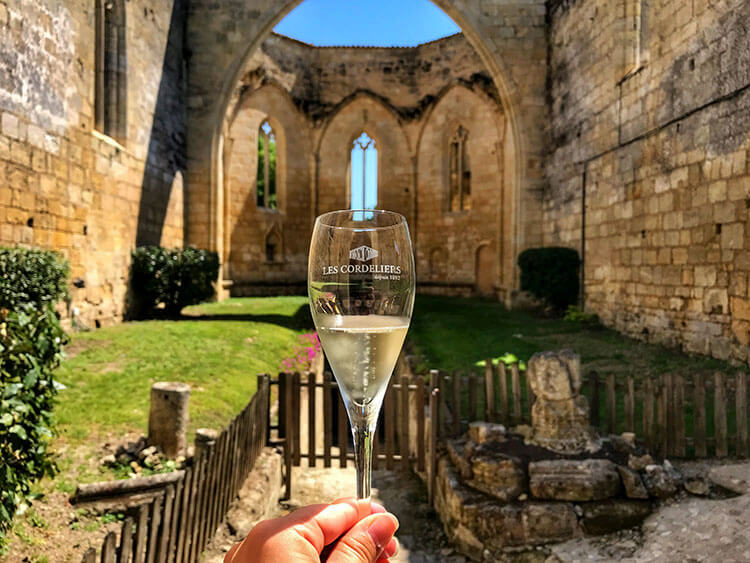 Guided tours in English are available daily in July and August at 5:30pm and can be booked at the Saint-Émilion Tourist Office or online in advance. 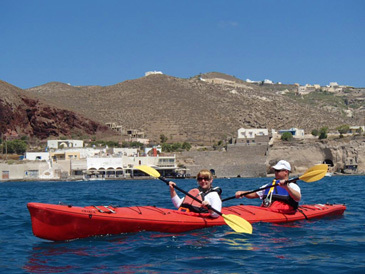 Small groups can request tours by appointment only outside of July and August. 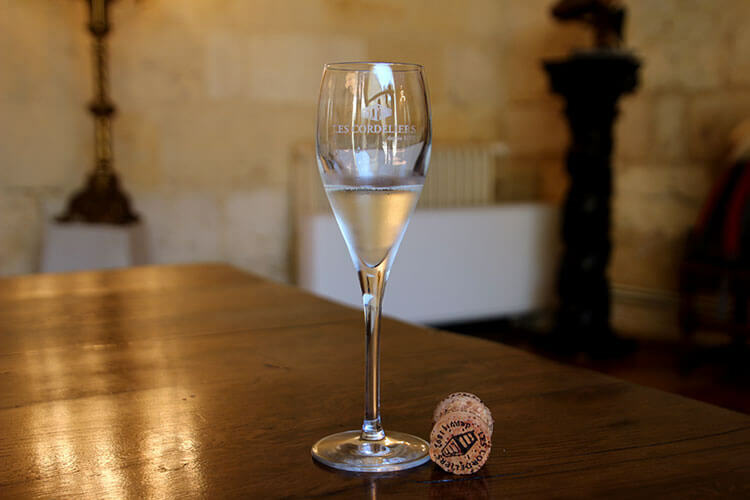 The walking guided tour lasts about 45 minutes and ends with a presentation of the Crémant de Bordeaux range produced and a tasting of your choice. The Saint-Émilion and Les Cordeliers TukTuk Tour is available daily from April through November and must be booked at least 15 minutes in advance. The tour lasts about 1 hour 30 minutes and ends with a glass of Crémant de Bordeaux in the Cloister. 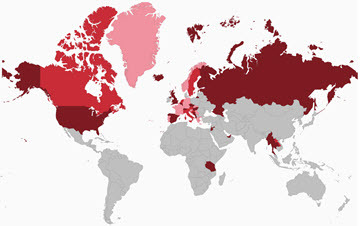 This article contains affiliate links. When you book on Oui SNCF through our affiliate site, we earn a small commission at no additional cost to you. Love the history behind this winery and what a fabulous place to visit. Adding it to the list for our future trip to Champagne! You’ll have to add it to your list for your future trip to the Bordeaux wine region, because Les Cordeliers is in Saint-Émilion though. What a lovely experience! Crémant wines are so wonderful — like a secret weapon in wine enjoyment. I like the foto of the cork prior to being put to use. Fascinating stuff. Thanks for sharing. There are some really lovely AOC Crémant de Bordeaux produced here in the region, but what I especially love about Les Cordeliers is the ambiance of sipping that Crémant in their garden. What an amazing adventure. I have wanted to explore this beautiful region. The cloisters, the Tuk Tuk tour and Crémant? This is an area I need to visit! Bordeaux definitely doesn’t disappoint! You should plan a trip. I love combing historic site visits with visiting wineries! Particularly monasteries. I spent time recently in Ribeira sacra ( lots of beautiful old monasteries & vineyards) & have also always loved Provence for this. This part of Bordeaux needs to get added to my list!